Well, I spent Easter Sunday building this trailer. 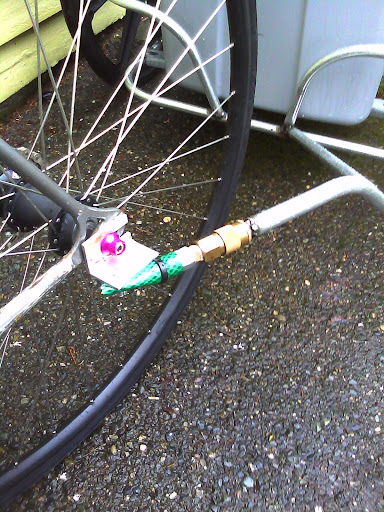 It started as two pieces of 1/2"emt (electrical conduit, $1.80ea @ Lowe's), an old wheelchair discovered in a pile of junk behind someone's house (I paid them $20, probably could have been free), a piece of uni-strut from a garbage can outside WSECU in downtown Olympia, an air-hose coupling from Harbor Freight (already had this but not more than $2 new) and the bin was ~$12 on sale @ one of the big Lowe's-Depot stores. There is a little bit of aluminum angle stock from my scrap bin and a bit of scrap hose for the flexible bit of the hitch. Plus a little barely adequate welding (read: ugly) yields a surprisingly strong trailer. I weigh about 215lbs and it didn't even budge under my weight. I toted home my full weeks groceries in it without a problem. It tracks great, and with the large wheels has no problem going over curbs. I kept the C.O.B. low and it seems to be happy with that. 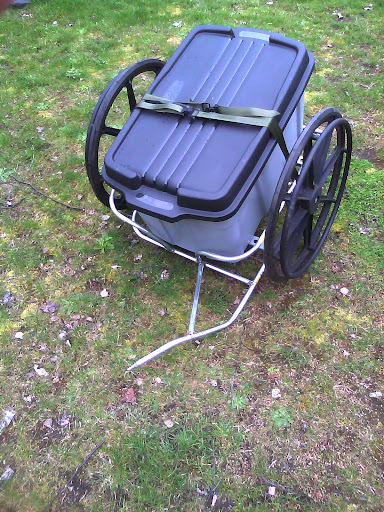 It seems very light, I haven't weighed it yet, but I can lift it easily (my guess is about 30lbs). 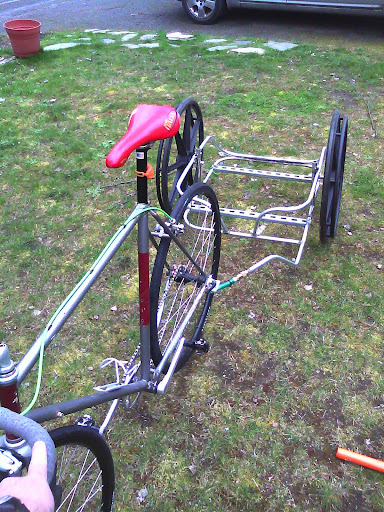 I found some plans online for another trailer using bike wheels. I will be making one of those soon. This is fun. I am one step closer to bike commuting for everything. The kids make it hard with their band instruments, but other than that, I hope to be bike only by summer quarter. You know what would be nice though? A close up of the axle arrangement. Why spend 300 bucks on an overpriced bike trailer? I will add a picture of the axle set-up when I get a chance. it is funny how it is set up. 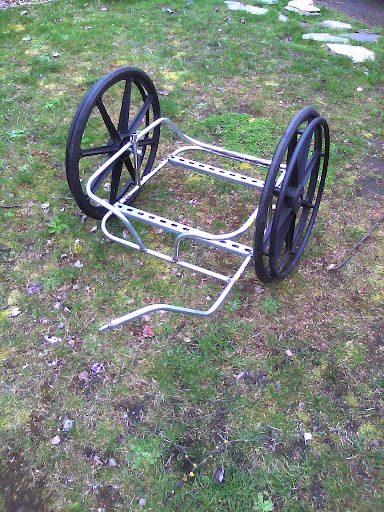 I just cut the wheelchair up for the axle attachment, but ended up using the entire bracket (shaped like an upside-down "T") it was the right size for the conduit to slip right through and then I welded it in place. With this set-up it is amazingly strong. Cool blog, I hadn't come across www.hackin5hit.com previously in my searches! I'm a little late to the party, but this is AWESOME!